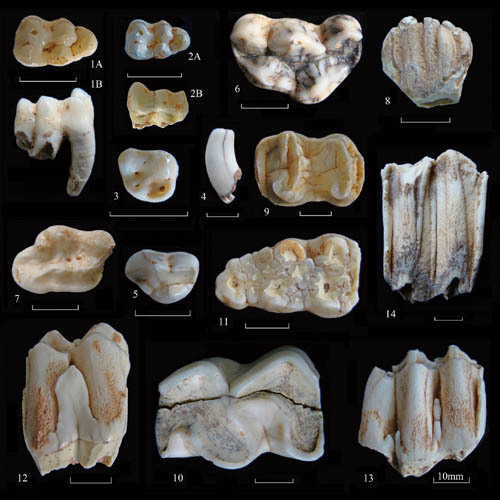 A joint team from Institute of Vertebrate Paleontology and Paleoanthropology (IVPP), Chinese Academy of Sciences, Institute of Cultural Relics and Archaeology, and Office for Cultural Relics Administration of Daoxian County, unearthed five hominin teeth and a large number of mammalian fossils from the Fuyan Cave site in Daoxian County, Hunan Province of China during an excavation carried out in September and October, 2011. Researchers announced their finding in the latest issue of Acta Anthropologica Sinica 2013 (2), providing new data for the study of human evolution and adaptive behavior in South China. Fuyan Cave site, also called Houbeishan cave by local farmers, was initially discovered in 1984. It is located in Tangbei village, Lefutang town, Daoxian County, Hunan Province (latitude 25°39′02.7″N, longitude 111°28′49.2″E, 232 m above sea level). The Fuyan Cave, developed in the Upper Paleozoic limestone, is located in the hinterland of South China Plate, and the south margin of North Subtropical Zone. The peak forest karst and karst basin are well developed in this region. The Fuyan Cave was formed first by the vertical vadose water dissolution and later by the horizontal vadose water corrosion. The cave, with main subject extending from north to south, belongs to large-sized pipeline type cave, and was filled with sand gravel and red clay. This excavation was carried out in two trenches in an area of total 20m2. Five hominin teeth and large number of mammalian fossils were unearthed. The general morphological characteristics of the five hominin teeth is quite similar to those of Homo sapiens, and the size of these teeth all falls into the tooth size variation of Chinese modern humans. Thirty nine mammalian species, including some undetermined species, have been recognized, and only a few of them are extinct, e.g. Ailuropoda baconi, Crocuta ultima, Stegodon orientalis, Megatapirus augustus and Sus cf. australis. Preliminary U-series dating shows that the sediments were formed after 141700±12100 years, and the general feature of the mammalian fauna suggests a late Late Pleistocene age. Therefore, researchers inferred that hominin probably occupied the cave in the Late Pleistocene. “Our excavation shows the cave has great potential perspectives. Further excavation and laboratory study of cave development, filling sequence, hominin teeth morphology, dating, and environmental change from the Fuyan Cave as well as some adjacent caves will help better understand the human evolution and adaptive behavior in Southwest Hunan, east Guangxi, and north Guangdong”, said corresponding author Dr. PEI Shuwen of the IVPP. This work was supported by CAS Strategic Priority Research Program and the Key Research Program of the Chinese Academy of Sciences.